Save the Date for Beast Feast 2019: Surf, Turf, and More presented by Regions Bank and hosted by the Centenary Alumni Association! Saturday, May 18, 2019! The annual Beast Feast is a unique, festival style culinary fundraising event featuring wild game, seafood, and other “off the menu” items prepared by local backyard chefs and popular restaurateurs. 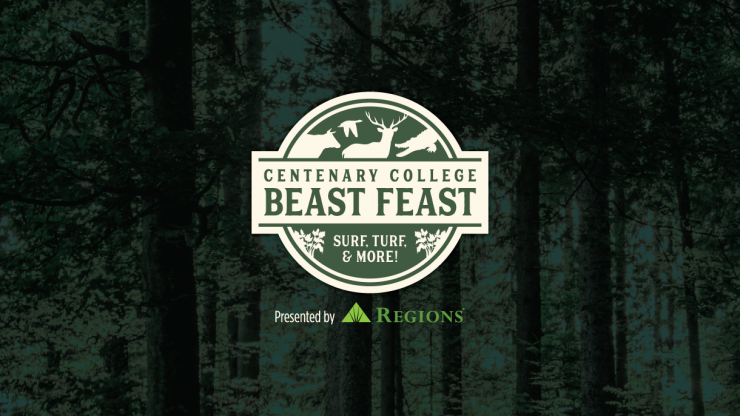 Beast Feast 2019: Surf, Turf, and More is set to take place on Saturday, May 18, 2019 from 4:30 - 7:00 pm on Centenary's Jones Rice Field. Consider joining us as a Beast Feast 2019 sponsor or signature chef/cook team. View photos from Beast Feast 2018 which took place on Saturday, May 19, 2018. There are a variety of sponsorships levels available. Tickets start as low as $25 per person! Sign up to be a signature chef as an In-Kind Tent Sponsor.